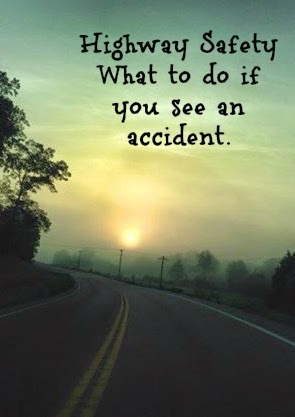 The Missouri Mom: Accident Safety - What to do when you drive up on a car wreck at night? Accident Safety - What to do when you drive up on a car wreck at night? maybe a possum or two, and a lot of white and yellow lines. However, last night as I topped the hill I saw a man standing in the middle of the road - dancing. My first thought was "oh boy, this should be good" then I noticed his car was parked dead center of a giant tree and was not going anywhere any time soon. It was just a few minutes after midnight, and I knew I may be the only person traveling that particular highway for hours, so I knew (for my own conscious) I had to stop. While I won't go into details of the accident, because frankly I know very few, I will share a few tips on how to stay safe and still do your civil duty to help a fellow citizen in need. - Do not get out of the car - while I could see the gentleman's car was definitely messed up, I did not know this guy, nor did I know what he was capable of. I stayed inside my car and directed the man to stay 3 foot away from the window of my car - I told him if you come close I will leave. - Do not give them your name - you are not required to introduce yourself to the person you are helping. I rolled my window up when I was speaking to the 911 dispatch officer - I gave her my name and phone number, and requested that she stay on the line with me until someone else arrived on the scene of the accident. - Do not offer to help - I never asked the gentleman if I could help him. I instructed him that I was calling 911 to get some help, but I never offered any assistance to him. - Do not roll your window all the way down - I know it seemed rude, but I kept my window cracked (about an 1 1/2) with my finger on the button when I needed to speak to him - the rest of the time it was completely up. - Do not let them know if you have any weapons - letting someone know what you have on you, could only make them want what you have. It is okay to protect yourself, but keep your tools to yourself. - Ask if they are alone - see if there is someone else in the car, you need to let the authorities know, but also you need to know so you can protect yourself. - NEVER assume you are safe - for me it was a gentleman who honestly was not completely with it - could have been under the influence of something, but even if it had been a woman and children I would would have treated the situation the same. They may seem okay, but you do not know what you cannot see - it could always be a trap. Remember, while it is always good to help someone else, you are still the most important person in your own life.